Relatives: Son of Harry and Emily Baker of 3 Bridge Street, Hadleigh. Husband of Henrietta E. Bridgland (formerly Baker), of Plumtree Cottage, Benenden, Cranbrook, Kent. Address: 3 Bridge Street, Hadleigh & Plumtree Cottage, Benenden, Kent. Private Baker was entitled to the above three medals; 1914 Star, British War Medal and the British Victory Medal. The whereabouts of Private Baker's actual medals is currently unknown. THE FIRST TO FALL - The Commonwealth War Graves Commission website suggests that Pte James Baker of the 2nd Suffolks was killed in action at the battle of La Cateau on 26 Aug 1914 aged 28. However, since this project began in 2014, new information has come to light that indicates that he was actually captured at Le Cateau and transported to a Prisoner of War camp in Germany where he died some months later. James was a professional soldier before the war although we do not know exactly when he joined up. His wife Henrietta was born in Aldershot and so it is possible that they met while he was stationed in the Aldershot area. 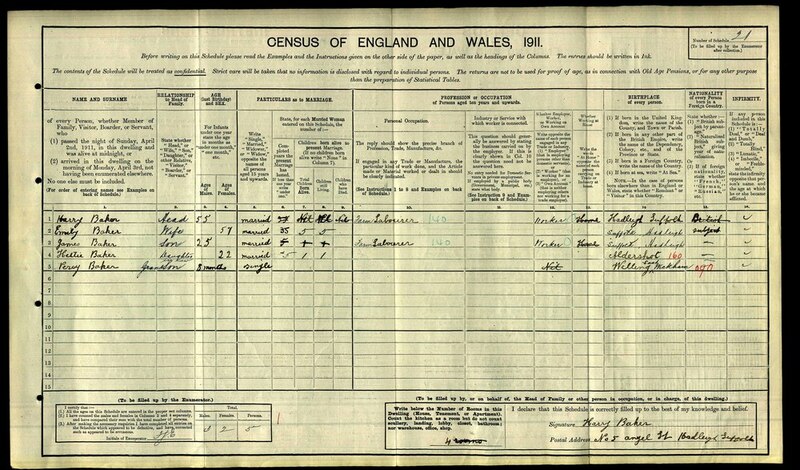 We know from the 1911 census that James along with his wife Henrietta and baby son Percy (8 months old) was living with his parents, Harry and Emily Baker at 5 Angel Street, Hadleigh. It also tells us that both Harry and James were farm labourers which could suggest that by 1911 James had left the Army. With the outbreak of war, James would have been recalled to the colours. When Briton declared war on Germany on the 4th August 1914, regular Army units were mobilised. Jame's regiment, the 2nd Suffolks were based at the Curragh in Ireland. They along with other regular regiments were made ready and rushed over to France as part of the British Expediton Force (BEF) to try to halt the German advance. The BEF took part in the opening engagements of the war and the 2nd Suffolks took part in the battle of Mons and the subsequent retreat. At Le Cateau, the 2nd Suffolks of 14th Brigade, 5th Division, occupied the hill above the town. The battalion received the order to ‘stand fast’ just as it was about to move off, and was forced to improvise its defensive position, much of it exposed. The 2nd Suffolks then played a key role in holding back the Germans. The battalion’s tenacious defence of the high ground overlooking Le Cateau was crucial in enabling the 5th Division to retreat south-west. A substantial effort was made by the German infantry and artillery to dislodge the Suffolks who lost 4 Officers and 75 men. A memorial (pictured) now marks the area of the Suffolk’s trenches. 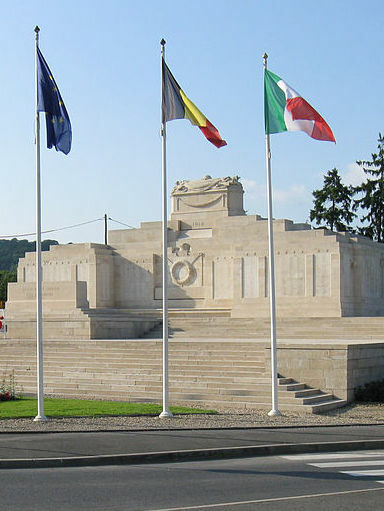 Private James Baker is commemorated at La Ferté-sous-Jouarre Memorial to the Missing which lies some 66 km to the East of Paris. Deploying with the BEF in August 1914 would make James entitled to the 1914 Star, sometimes known as the ‘Mons’ Star. This was proudly worn by the survivors of the BEF who also dubbed themselves the ‘Old Contemptibles’ a name that they were supposedly first called by the Kaiser who labelled the stubborn force that stood in his way as that “contemptible little Army”. 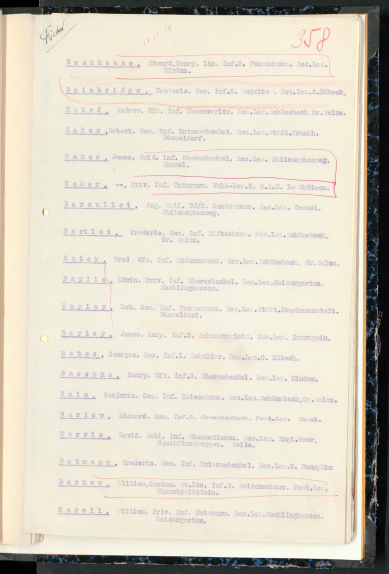 The CWGC registers which were compiled after the war state that Jame's parents had moved to 3 Bridge Street, Hadleigh and that his wife, who had become Henrietta Bridgland (possibly re-married) had moved to Cranbrook in Kent. An article from the Suffolk & Essex Free Press of March 1915 reported that Private Baker had been taken as a prisoner of war and had died some time later in captivity in Germany. We hope that this page has been able to tell the story of James Baker. If you know of any information which might help to add to the story then please get in touch.